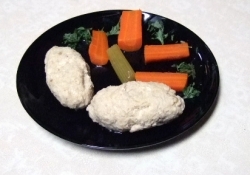 Gefilte fish ( poached fish quenelles) are great any time of the year! . Everyone loves my recipe! We like to serve these with a creamy horseradish sauce Don't let people make you believe that making gefilte fish is hard or overly time consuming- it really is not. So impress your guests this year with flavorful gefilte fish! If you can make homemade soup, you can make this! Tips even your grandmother may not know ! Liberally salt the stock as well as the gefilte fish mixture with coarse kosher salt and freshly grated black pepper. When the fish cools in the savory stock, they will absorb more of the good flavor. Sugar is optional but just a bit of sugar ( 1 tsp for fish mixture , 3 to 5 tsp for stock ) will bring out the savory tastes in the fish as well as the stock without making it sweet. Some cooks also like to add a bit of paprika to the fish or to the stock- up to you. Gefilte Fish will last up to a week chilled covered in the fridge so I like to make them a few days ahead of time. And yes gefilte fish can be frozen also! All should be free of any bones, skin etc. Fish heads, large fish bones etc. If not bought already ground: Using a food processor/or meat grinder, grind fish first , then grind onion. You want a ground consistency not a liquidy puree consistency. Place fish and onions in a large bowl. Add the fork beaten eggs, salt and pepper optional sugar and just enough matzoh meal to bind. If a spoon stands up in the mixture it is just right. If too thin, add a bit more matzoh meal. Since I don't drain the ground onions, the onion juice acts as additional liquid which flavors the fish. Shape mixture into balls or torpedo shapes like bottled gefilte fish. Gently drop into the fish broth. Cover and very gently simmer 1 1 /2 to 2 hours. Fish will swell up a bit. When you test one they should be just like the jar consistency, firm enough to be formed nicely and yet a nice soft texture. Some like to let fish cool in the broth, others remove fish to a casserole dish. You don't have to cover the balls in the stock if you don't want. However, the stock whether reduced or not ( reduced meaning even boiled down further - which is optional ) will keep the fish moist and add more flavor. For presentation remove fish from the gelled stock. Yield: : 1 1/2 dozen of traditional oval shaped and sized bottled gefilte fish. Place fish on a platter and surround if desired by cooked carrots, cooked celery, sprigs of fresh parsley. Of course horseradish and mustard for those who like it or however you want to present it. Bake in several inches of water along with carrots, celery, sweet onions, kosher salt , pepper and fresh thyme for about an hour at 350 F.
Spoon on the broth over fish, several times when baking. I find that baking is not as good as the cooking in the broth but still is an easy alternative method. Then remove pan of fish out of oven to cool . When cool, place in the fridge for several hours or even over night.. This allows the fish to cool down and firm back up so you can slice it into round or oval shapes if you have formed it into a roll. Form cold firm mixture into ping pong shape balls and deep fry them! Great with a creamy horse radish sauce or tarter sauce ! Really a must try once thing. Partial Pan Fry : some people actually pan fry the formed uncooked gefilte fish mixture first and then add it to the pot with the broth to finish cooking. The pan frying adds some flavor and texture but I feel it is not a necessary step. But it's nice to know ! I'm impressed, I must say. Seldom do I encounter a blog that's both equally educative and entertaining, and let me tell you, you've hit the nail on the head. The issue is something too few folks are speaking intelligently about. I'm very happy that I found this during my hunt for something concerning this.